Sun Moon Earth – With beautiful illustrations and a detailed map, Sun Moon Earth has everything you need to get ready for the 2017 solar eclipse. On August 21, 2017, more than ten million Americans will experience an awe-inspiring phenomenon: the first total eclipse of the sun in America in almost forty years. In Sun Moon Earth, astronomer Tyler Nordgren illustrates how this most seemingly unnatural of natural phenomena was transformed from a fearsome omen to a tourist attraction. From the astrologers of ancient China and Babylon to the high priests of the Maya, Sun Moon Earth takes us around the world to show how different cultures interpreted these dramatic events. Greek philosophers discovered eclipses’ cause and used them to measure their world and the cosmos beyond. Victorian-era scientists mounted eclipse expeditions during the age of globe-spanning empires. 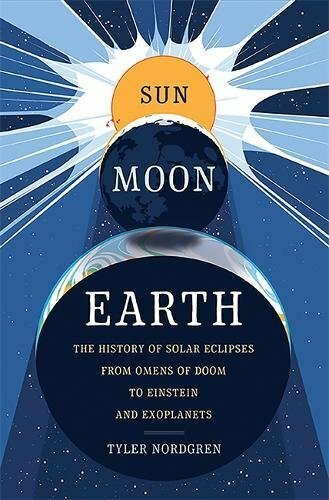 And modern-day physicists continue to use eclipses to confirm Einstein’s theory of relativity.Beautifully illustrated and lyrically written, Sun Moon Earth is the ideal guide for all eclipse watchers and star gazers alike. Tyler Nordgren is an astronomer and Associate Professor of Physics at the University of Redlands. He earned a PhD in astronomy from Cornell University and has worked as an astronomer at both the U.S. Naval Observatory and Lowell Observatory. In 2004, NASA’s Spirit and Opportunity rovers landed on Mars carrying sundials, or “Marsdials,” which he helped design as part of a team of seven other scientists and artists. Since 2007, Nordgren has worked closely with the U.S. National Park Service, traveling the country giving public talks, promoting his books, and helping train rangers to provide astronomy outreach in the parks. He lives in Claremont, California.